Choose a shovel that is right for you. 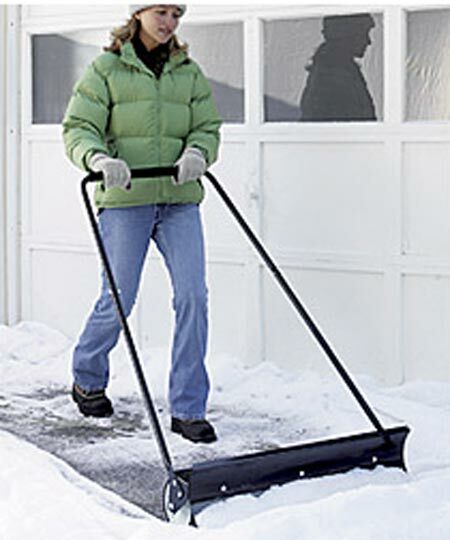 Be sure that the shovel has a curved handle, as this enables you to keep your back straighter when shoveling. A plastic shovel blade will generally be lighter than a metal one, thus putting less strain on your spine. Push the snow; do not lift it. Pushing puts less strain on your spine than lifting the snow. When gripping the shovel, make sure there is about a twelve inch span between your hands. By creating this distance, you increase the leverage and reduce strain on your body. If you must lift snow, squat with your legs apart, knees bent, and back straight. Do not bend at the waist. Be sure your muscles are warm before you start shoveling. Cold, tight muscles are more likely to strain or sprain than warm, relaxed muscles. For this reason, it is important to take frequent breaks. This also allows you to stretch your back, arms and legs. Never throw snow over your shoulders.